It is unusual for policies that are still under discussion by committees and the Board to be discussed in public at the instigation of one or more Board delegations. In a blog posted on 28 March, Meg Davis, a consultant to the Developing Country NGO Delegation, the Developed Country NGO Delegation and the Communities Delegation, discusses proposed changes to the Eligibility Policy. Aidspan labeled these discussions “appropriate and useful.” In this article, we provide a summary of the contents of the blog. For weeks, the Global Fund has been criticized for entering into a partnership with Heineken because of concerns about the effects of alcohol on health. Now, the Global Fund has suspended the partnership – but, it says, for reasons that are unrelated to the criticism: The Fund said it was concerned about Heineken’s use of female beer promoters in ways that expose them to sexual exploitation and health risks. Executive Director Peter Sands announced the decision in a message to the Board and in a statement on the Fund’s website. Chief of Staff Marijke Wijnroks is leading a review of internal Global Fund policies on sexual harassment in light of recent developments in other global health organizations (and beyond). The Global Fund has an Employee Handbook and a Code of Conduct for Employees that are designed to prevent and address instances of bullying and harassment, including sexual harassment. Since 2011, the Global Fund has investigated three cases of alleged sexual harassment. Only a select group of the world’s top global health organizations have placed gender equality at the center of their operations, both programmatically and institutionally, according to a study carried out by Global Health 50/50. The Global Fund ranked among the top nine of the 140 organizations studied. Many of our readers tell us that they find the Global Fund’s Co-Financing Policy confusing. So, in this article we provide a detailed explanation. The Co-Financing Policy is contained in the Sustainability, Transition and Co-Financing Policy, adopted in April 2016. It replaced the Global Fund’s policies on willingness to pay and counterpart financing. Iraq’s TB component was in the process of transitioning away from Global Fund support when the ISIS emergency hit. Now the plan is to have Iraq join the Global Fund’s Middle East Response initiative when it enters its second phase in 2019. In December 2017, the Global Fund Board approved an extension for Iraq’s existing TB grant through the end of 2018. President Donald Trump had sought a $224 million cut to the U.S. contribution to the Global Fund, but the FY 2018 budget adopted by Congress left the contribution intact at $1.35 billion. This is the first contribution by the U.S. towards its pledge of $4.3 billion for the replenishment period 2017–2019. The budgets for other global health programs generally remained unchanged from FY 2017, despite the president’s proposed cuts. The Global Fund Board has approved another $102.9 million in funding for six grants emanating from four funding requests submitted by four countries. Interventions worth $40.3 million were added to the Unfunded Quality Demand Register. Nepal led the way with three grants approved worth $43.6 million. The cumulative amount awarded to date from the 2017–2019 allocations is just under $9 billion. Eastern Europe and Central Asia is one of two regions where planning for the transition away from Global Fund support is most advanced. (The other region is Latin America and the Caribbean.) This article provides an overview of the transition status of HIV, TB and malaria components in EECA countries. The new TB guidelines from the World Health Organization will expand access to testing and care for people with latent TB infection. The precise implications for the Global Fund are not yet known. When it reviewed Pakistan’s recent TB funding request, the Technical Review Panel requested more information on how the needs of key populations such as refugees and people in congregate settings would be addressed. This issue was cleared during grant-making. This article provides a summary of the comments of the TRP and the Grant Approvals Committee on the funding request. In this “OF INTEREST” roundup, we highlight four articles ranging from TB as a growing public health threat to mentoring in the era of #MeToo. On 22 March, the U.S. Congress approved a budget for Fiscal Year (FY) 2018, which includes a $1.35 billion contribution for the Global Fund, equal to what the U.S. contributed in FY 2017. In so doing, Congress ignored a proposed budget from President Donald Trump which would have resulted in $225 million less funding for the Global Fund. In the U.S., FY 2018 runs from 1 October 2017 to 30 September 2018. The $1.35 billion for the Fund is the first contribution by the U.S. towards its pledge of $4.3 billion for the period 2017–2019. For 2014–2016, the U.S. contributed $4.1 billion. U.S. 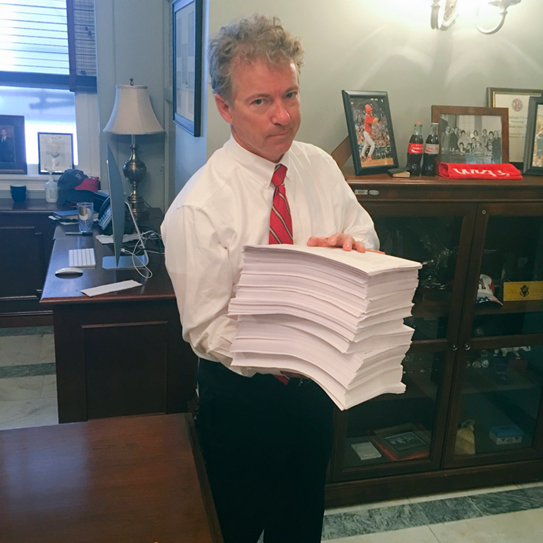 Senator Rand Paul holding up what he said were the 2,232 pages of the budget bill. (We didn’t count.) The photo is from a Twitter post he sent. The Congress also resisted President Trump’s call for steep budget cuts in other areas, including other global health programs and the State Department. The FY 2018 budget allocated funding for three important U.S. bilateral programs: $4.65 billion for PEPFAR (President Trump wanted a $1 billion cut); $755 million for the U.S. President’s Malaria Initiative; and $261 million for USAID’s TB program. The FY 2018 budget provides $54 billion for “state and foreign operations.” This is down about 6% from the FY 2017 budget because the latter included some one-time costs. President Trump had sought a 30% cut. The FY 2018 budget also allocated $37 billion to the National Institutes of Health (NIH), up $3 billion from FY 2017 (President Trump had sought a $7 billion cut). The NIH funds clinical and biomedical research, including for HIV, TB and malaria. But Friends was already focusing on the FY 2019 budget. On 16 March, two members of the House of Representatives sent a letter to the leadership of the House Appropriations Subcommittee on State Foreign Operations and Related Programs calling for continued, robust funding in FY 2019 for PEPFAR and the Global Fund. Friends worked with several other members of the Global AIDS Policy Partnership to successfully increase the number of Representatives’ signatures on the letter (compared to the previous year). This year’s letter included 162 House Members, and more than doubled last year’s number of Republican signatures (from eight to 17).